As far as many of us are concerned, Santoríni is one of the most spectacular places on earth. The drama of her multicoloured volcanic cliffs is perfectly contrasted by the peaceful beauty of her white, cubist villas - all arranged around the smooth and near perfect arc of the flooded blue volcanic caldera. She's as interesting as she is beautiful, what with her wineries and archaeological treasures, her buzzing tavernas, fine restaurants and boutiques and calm beaches beckoning welcomingly. Now you just need to know the best places to stay on Santoríni to get the most out of her! Imerovigli may only be 2km from Santoríni's busy capital Thira but feels a million miles away in terms of peace and quiet. Oia is located at the northern tip of the island and some believe that it's the place to come if the view is top of your wish list - from here you can see not only the Caldera but the pretty white villages scattered to the south, not to mention the all-important sunset! Thira, with its steep, colourful cliffs is dramatic yet relaxed. This is Santoríni’s main town with more than its fair share of beautiful white cave hotels and apartments with infinity pools. Behind the hotels are the narrow streets of the town with the shops, bars and restaurants. Tear yourself away from the view and you’ll find the Museum of Prehistoric Thira, several galleries and your kids will love the cable car down to the docks. Nearby is the atmospheric site of Ancient Thira. Just two kilometres from Thira, Imerovigli is quieter and seems to have more churches. Imerovigli has great access to the restaurants, bars, museums and the port of Thira without the hassle of being in the thick of it. At Santoríni’s northern arc, the lovely little village of Oia has the cream of the crop when it comes to perfect views - partly because you can see the stacked sugar cubes of Thira and Imerovigli. Most of Oia can only be reached on foot - it’s steep - they still employ donkeys to take away the garbage. 300 steps below the town are the beaches, plus there’s a Maritime Museum. Originally a Bronze Age settlement, Akrotiri is situated on the southern tip of the island. The settlement was destroyed by a volcanic eruption in 1627 BC, but the ash preserved many colourful frescoes and recent excavations have done a wonderful job at restoring a wide variety of ancient artefacts. A top spot for culture-vultures! Meanwhile, Vlychada and Kamari are known for their rugged coastal beauty and are ideal if you're looking for a tranquil break by the seaside. If Santoríni's on your bucket list then to really experience her arrive by sea! She's a spectacle on approach. Santoríni is famous for sunsets - many believe they’re the world’s most spectacular, so opt for one hotels that have made our list of the 10 Best hotel views on Santoríni. And don’t forget that some of the islands in the group are still ‘smoking’, you can take a tour to see the steaming vents, hot springs and lava flows dating from the 1950s. As well as building the Cycladic ‘sugar cube’ houses, people lived in cave houses cut into the cliffs and the rocks. Some are still in use, some abandoned and some have been turned into some of the best places to stay on Santoríni. It’s definitely worth trying to see a few and possibly a few of the churches built in the same way. Santoríni is also home to some of the world’s oldest vineyards. The volcanic soil and unique climate of the island mean the local wines have quite a distinct flavour. The lighthouse at Faros has a reputation for being a great spot for taking photos. Santoríni has beaches in three colours: black, red and white. You’ll find everything here from secluded coves without any sand or facilities but excellent swimming conditions, to busy beach bars and perfect spots for snorkellers. Don’t forget to walk: Santoríni is an incredibly beautiful destination so don’t risk coming away with only the classic photos, explore the island properly on foot and you’ll discover your own lookouts and highlights. Please note that this island is an incredibly popular destination (especially during the peak summer months), and most of the best places to stay in Santorini get snapped up quickly. So do plan ahead and make your booking early. The Avaton Resort & Spa has seven fantastically chic, neutral toned rooms with private balconies, an excellent Mediterranean restaurant and an indulgent spa. It’s very calm and peaceful and the views are amazing. The Hotel Ilioperato is a lovely four-star hotel in Imerovigli with eleven rooms and apartments, all with private balconies, plus a lovely pool and fantastic sea views. Great value too. 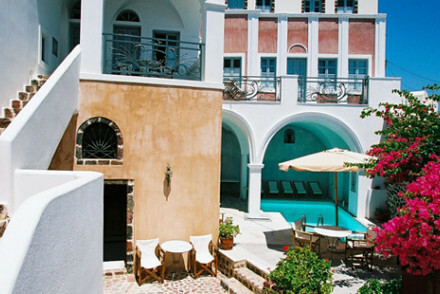 The Hotel Afroessa is a traditional hotel with a collection of ten understated rooms and maisonettes. They also do fantastic breakfasts on their private balconies. If you thought Santoríni was out of your price range think again, the Remezzo Villas in Imerovigli are a collection of 18th Century villas nestled into the cliffside with traditional Cycladean features and colours and a room rate from €120 per night. The Kapari Natural Resort also offers reasonably priced luxury, this time in Imerovigli, carved right into the cliff face. There are 19 neutral toned rooms, a few with private hot tubs, plus an excellent wine bar and restaurant with fantastic sea views. San Antonio’s stunning, uninterrupted views of the caldera can be seen from the private balconies of all of its 25 rooms which benefit from beautiful white decor, butler service and an extensive spa menu. And there’s a gourmet restaurant. Grace Santoríni is a palatial villa cut right into the cliff, with 22 all white rooms with fabulous views, private balconies and hot tubs, a lovely Mediterranean restaurant and an extensive spa. Chromata is one of the best places to stay in Santoríni to appreciate this romance. 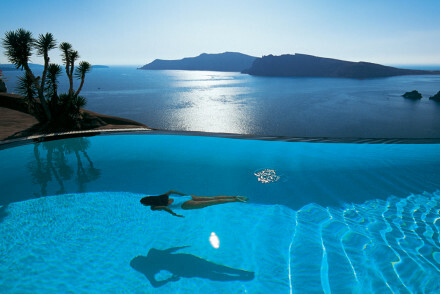 It has an infinity pool looking across the caldera! Built above traditional style 'cave houses' carved into the rocky cliff. Decked out in beautiful, simple luxury. Designed to make you feel like you're the only two people in existence. The Vasilicos in Imerovigli has a great spot, high on the cliff top with spectacular sea views. There are just seven simple, chic suites with the option to dine privately on your terrace. 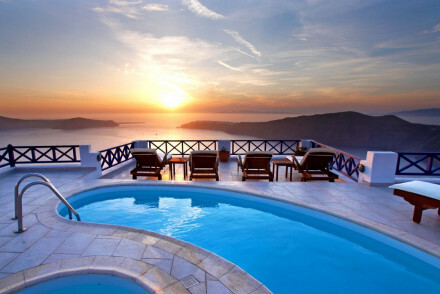 Tzekos Villas Hotel in Thira has been built into the side of the caldera to make the best of its views over the Aegean. 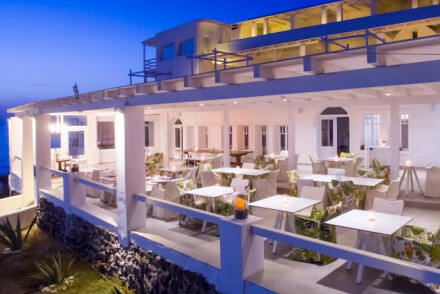 The decor is typically Cycladic and there are balconies overlooking the ocean. Peaceful. Aigialos is another great option for families with its collection of sugar cube houses on very top of the cliff. There are houses sleeping two people and mansions sleeping five - plus in between options and all have private balconies and access to a lovely pool and Mediterranean restaurant. Sun Rocks in Thira has fantastic views of the sea - especially at sunset, which you can enjoy in the lovely, intimate restaurant or on one of several sun terraces. There are just 17 oh-so-chic and romantic rooms. Our Guru’s best value recommendation is the Rena's Suites, a chic B&B in central Thira, with pretty all-white rooms and suites, a large pool and a relaxed restaurant. Almost unbelievably their rooms start from less than €60 per night. Zannos Melathron is a classically elegant 18th Century mansion hotel with just 10 rooms and suites, some with interconnecting doors. Cut right into the cliff, the rooms all have private balconies, plus there’s a great Greek/ Mediterranean restaurant and a lovely pool. Homeric Poems is a sophisticated cliffside hotel with 20 rooms and suites, a lovely pool and numerous sun terraces. There are beautiful views from almost everywhere, plus modern art to look at when you’re facing away from the views. Katikies is a romantic dream in white and blue with 27 luxuriously tranquil rooms and stunning views. They also have an exceptional infinity pool and poolside restaurant and excellent wine bar. Plus an extensive spa. The Kirini Suites & Spa is a fantastic, five-start hotel overlooking the Aegean, fastidiously designed in the Cycladic style, the suites are all white and very elegant. There’s a deluxe spa carved into the cliff and the restaurant is excellent. Esperas also offers different types of accommodation, from rooms to studios to suites and whole villas. You’re right on the coast, with spectacular views from private balconies. The rooms are rustic white with bright art works. Great value, starting from around €150 per night. 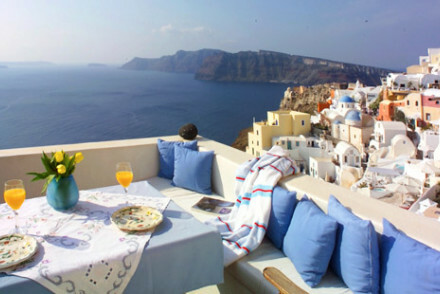 1864 The Sea Captain's House has just four suites, tucked into the old town of Oia. They all have plenty of character - think four-poster beds and antiques as well as whitewashed walls and balconies with incredible views you expect of Santoríni. The Ikies Traditional Houses are along a similar line, a five star collection of rooms, suites and maisonettes cut into the cliff face, all facing out onto dreamy caldera views. The furnishings are all white and some have private hot tubs, also with caldera views. Converted from 300 year old cave dwellings, the Perivolas LIfestyle Houses are now a collection of 20 tranquil, luxurious suites, plus a stunning infinity pool and beautiful terraced gardens. The Aenaon Villas are a great option for families with older children. There are seven villas in the group, all are white and ultra chic with huge private terraces and amazing sea views. There’s also a fantastic pool. Closer to the beach, and further from the cruise ship crowds, Santoríni Kastelli Resort is for families. It's a good size and beside a black sandy beach and friendly tavernas. Notos Therme Resort and Spa captures the real romance of the place. It's on one of the last relatively undeveloped bits of coast: around Vilhada, a tiny fishing village. Celebrate the tranquillity and views by treating yourself to a spa treatment or two. Perfectly romantic. Astarte Suites comprise of nine suites - each with their own private jacuzzi and balcony on which champagne breakfasts are served. You’re close to the beaches but there’s also a lovely pool. Prefer a private Apartment or Villa? Santoríni airport is linked to Heathrow, Gatwick and Manchester, with more flights available during the busier season. The airport is about seven kilometres from Thira. You can also arrive on Santoríni via cruise ships, which dock at Skála Firás, before taking the 580 steps up to Thira - unless you hire a donkey or take the cable car. Or, you can catch the ferry in to Athinios. Santoríni really has just two seasons, summer, which is between March and October and temperatures range between about 11°C and 40°C, and winter, between November and February, when temperatures range between 10°C and 25°C. It’s certainly far from cold in winter, but the Greek islands tend to be more difficult to get to because of the reduced ferry timetable, and some parts of the island (including restaurants and bars) close down. But if you can work out the transport then you’ll be rewarded with a quieter, less expensive island. Expand your search to include all the best places to stay in the Cyclades. 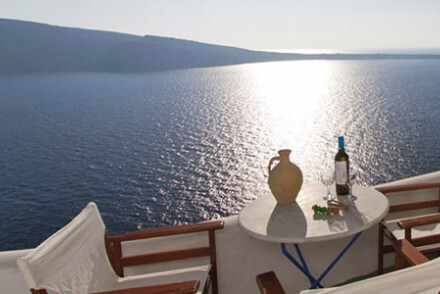 Refine your search to the best places to stay in Thira or the best places to stay in Oia. How about the best places to stay in Imerovigli? 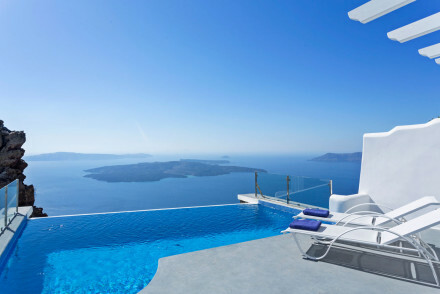 A grown up, all suites property with breathtaking views over Santorini's famous caldera. Built in typical Cycladean style, smart all white suites offer every luxury and many come with either private jacuzzi or plunge pool or both! Gourmet restaurant and spa too. Romantic heaven! Swimming Pool - Heated outdoor pool with stunning views, plus an indoor hydrotherapy pool in the spa. Spa - The "Heaven Spa" features a hammam, and sauna and offers a range of treatments. Chic B&B in central Fira. Fantastic value, pretty all white rooms and suites, large swimming pool, and easy access to restaurant, sights and activities around. A great choice for a couple or family on a budget. Beach hotel landscaped into volcanic cliffs next to an unspoilt fishing village, with stepped terraces and fabulous views. White on white interiors with pop coloured bed throws. A tranquil hideaway with great spa and range of natural treatments. Excellent Mediterranean cuisine. Wonderfully romantic. Honeymoons - A wildy romantic setting with secluded rooms, private terraces overlooking the Aegean Sea and poolside cocktail bar. Spa breaks - Indulge yourself with the wide range of therapeutic treatments based on the volcanically enriched springs. Sailing - Located next to the only marina of Santorini island making it ideal for those travelling with their own yachts or boats. A traditional hotel with fabulous sea views, understated rooms and maisonettes, and fantastic breakfasts from private balconies. A romantic understated spot, and great value too. Perched atop the village of Firostefani, Mill Houses is a sumptuous hotel that offers magnificent views of the Santorini volcano. 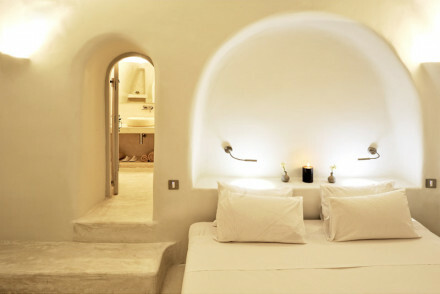 Built in traditional Cycladic style, its rooms are tasteful and luxurious. Explore the charms of the surrounding area or simply soak up the stunning view by the pool. 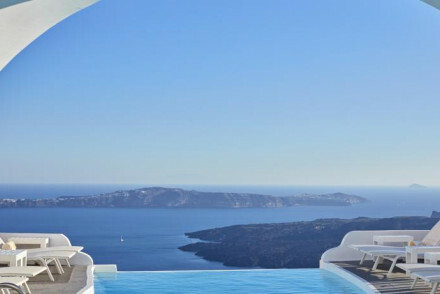 Honeymoons - Honeymoon heaven, with elegant suites, verandas overlooking the Santorini volcano, fantastic food and poolside bar. Local exploring - Perfectly placed for exploring the stunning village of Firostefani, and trips along the coast. Local markets - Explore the local markets of Fira and pick up some regional produce to bring home with you. Sights nearby - Visit Santorini's volcano and hot springs two miles away. A stylish retreat, in the heart of the city. This mid-1900's renovated mansion offers creatively designed rooms, with chic contemporary décor, and lovely views of the sea. An outdoor pool, a cosy garden space, in room massages and wine tastings add to the charm. A classy yet modern vibe. Total relaxation - In a quiet and peaceful setting, its the ideal place to enjoy some time out, sit back and relax by the pool or on the terraces. Romantic Break - A perfect couples getaway with its chic and comfortable interiors, great service and food. Local exploring - Ideally located close to the centre of town as well as the beaches. Local markets - Explore the town area with several restaurants, cafes and shops. Nestled on the cliffside, the restored 18th century villas have classic Cycladean features: white washed walls, vaulted ceilings & curved edges. Spacious suites and rooms with private balconies for enjoying the jawdropping views. No restaurant but a short walk from local eateries. Totally romantic. 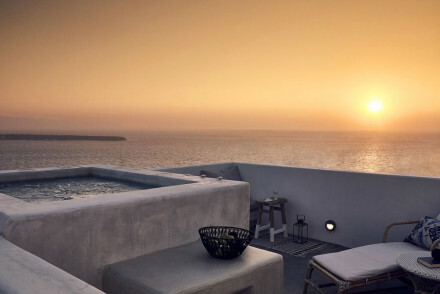 The lovely Apanemo Hotel, in Akrotiri on Santorini, offers stunning views of the Aegean. Apartment-style accommodation decorated in a typically Mediterranean fashion. Enjoy a rich buffet breakfast each morning and be sure to make use of the jacuzzi to fully unwind! A peaceful spot. 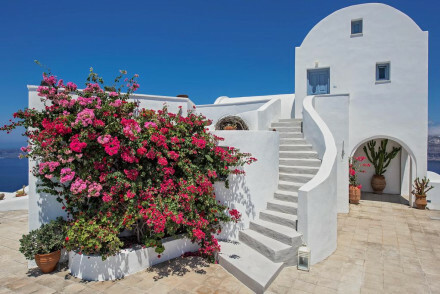 Brilliant white building in traditional Cycladic style set in pretty gardens. Fresh contemporary interiors with stand out artworks and soft pastel hues. Set steps from a beach and with bountiful in house activities and a spa. Romantic evening poolside al fresco dining. Total relaxation - Just steps from the renowned black volcanic sands of Kamari beach, with spa, hot tubs and cocktails by the pool. Diving - There is a diving center on Kamari beach where you can rent equipment and take lessons. Sailing - Take a boat trip to the volcano, a wonderful way to explore the coast. Sights nearby - Be sure to check out the nearby archaeological site of Ancient Thira. A lovely Four star hotel with a collection of rooms and apartments that have small kitchenettes and private balconies. 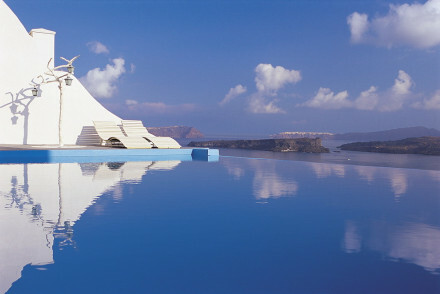 Fantastic sea views, traditional Santorini white and blue decoration, swimming pool. Excellent value, very romantic. 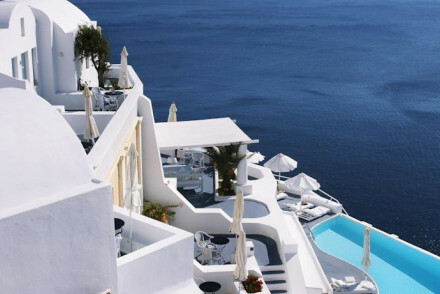 All white rustic chic accommodation ranging from studios to suites to separate villas on Oia's coastline. Charming rooms have splashes of art, kitchenettes, private balconies and spectacular views. Beautiful, romantic, family friendly too. Built amphitheatrically on the edge of the renowned Caldera in Santorini's capital, Tzekos Villas has breathtaking views over volcanic islets and the Aegean sea. 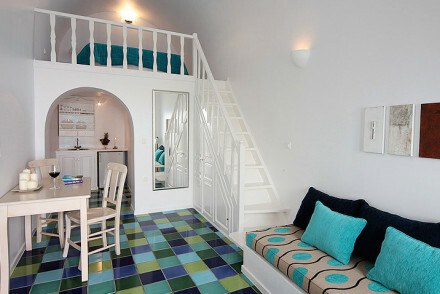 Rooms are typically Cycladic - bright white interiors, tiled floors, with verandas overlooking the volcano. Peaceful and romantic. A stunning hotel overlooking a pretty bay with elegant cream stone interiors featuring romantic arches and vaulted ceilings. The simple fresh design continues in the rooms, with pale furnishings, minimalist art and natural materials. Boasting a top-notch restaurant and terrace pool. Fabulous! A beautiful, whitewashed villa complex in the countryside of Oia. Guests can choose between three Cycladic villas with full self-catering facilities; the best have a private pool and verandahs. Expect clean, unfussy interior design with stylish soft furnishings. A great stay for groups or a family. 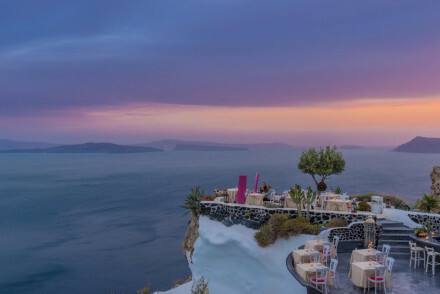 A romantic hotel tucked in the clouds of Santorini with spectacular sea views. Sultry suites have private jacuzzis, champagne breakfasts served on balconies, and creamy furnishings. Lovely pool and within striking distance of beaches and sights. Ideal for couples and honeymooners. Romantic Break - All suites feature a private hot tub and all have the most stunning views. Wonderful boutique hotel with funky rooms and suites. Splashes of bright colour throughout all white rooms, all with private balconies, some with private jacuzzis. Lovely Greek restaurant and swimming pool lounge area. Great for romantic getaways and family holidays. Sophisticated style and classical elegance in this 18th century mansion hotel. Sultry suites and some interconnecting rooms, cut from the cliff, have warm furnishings and private balconies. Fantastic Greek/Mediterranean restaurant, lovely pool, and lots to do in the villages and islands around. Foodies - Fantastic Greek cuisine. 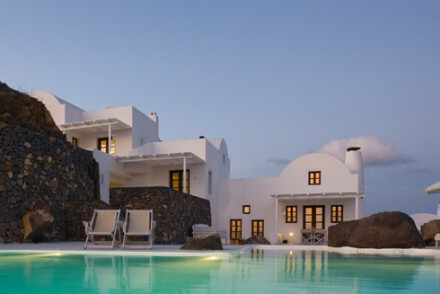 Gorgeous whitewashed villas on Kamari beach. Minimalist rooms have pressed concrete floors, driftwood accents, kitchenettes and private terraces. Outdoor pool, sauna and gym. Restaurant offers contemporary Greek flavours. Private beach and bed can be booked in advance. Effortless, grown up luxury. 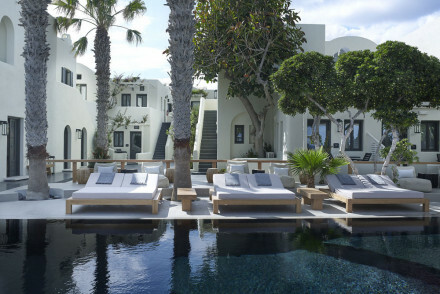 Fantastically chic all white hotel with an extensive bar and fantastic Mediterranean restaurant. Rooms and suites in neutral tones have private balconies, dreamy sea views, and all the modern gadgetry. Minimalist designs, indulgent spa, and calming views. Very romantic. A magnificent five-star hotel overlooking the sea. 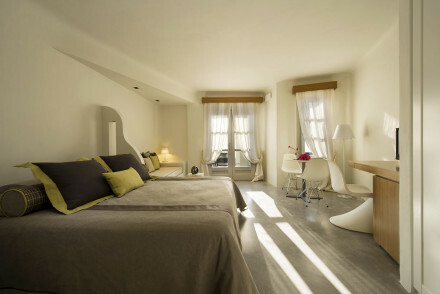 A modern, stylish take on the traditional Cycladic style, with rooms maximising on comfort and luxury. It's the perfect place for a relaxing, indulgent romantic break, with an extensive spa and a stunning setting looking out to sea. Honeymoons - Honeymoon heaven with sumptuous suites and private villas boasting outdoor hot tubs overlooking the stunning Aegean Sea. Local markets - Head off to explore the local markets of Oia and Fira to pick up some regional specialites. 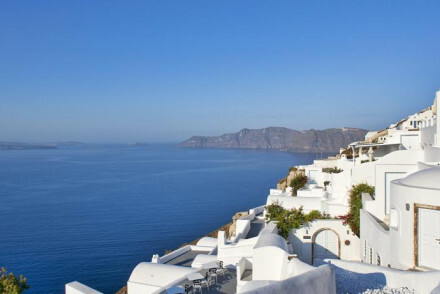 Views - Get stunning sea views from with cable car ride from Fira's Old Port. Sailing - The perfect stopping point for sailing trip around the Greek isles. A wonderful small hotel in old town Oia. Four suites have bags of character - four poster beds, fresh flowers, attractive linens, antique furniture, white washed walls, and private balconies. Fabulous sea views from verandahs, massages available and close to the beaches. Town - Oia is one of Santorini's most picturesque towns. Full of character - A house with a history. Very luxurious rooms and suites carved from the cliff face. Neutral tones, natural materials, clean lines, plus all the mod cons and a few private hot tubs. Excellent wine bar and restaurant with fantastic sea views. Romantic and very chic. Utterly romantic all white hotel with a collection of sugar cube houses on the cliff top. Each house, from super to mansion size, sleeps from 2 to 5 people. All have private balconies, white washed walls, and pastel blue furnishings. Lovely pool and Mediterranean restaurant. A cluster of 7 white villas house 7 ultra chic all in white rooms and huge private terraces. Dreamy sea views from its cliff top location, gorgeous pool area, and all in a secluded setting. Ideal for honeymooners, couples, and families with older children. A sophisticated cliff side hotel all in white with views over the ocean. Lazy terraces, luxurious rooms and suites, all the mod cons, lovely pool and splashes of modern art. A fabulous spot for couples, honeymooners and families with older children. In a picturesque village, this luxury hotel seems surreal. Perched on a cliff side, beautifully designed with white on white keeping in mind the traditional Cycladic style, rooms offer private terraces. The suites come with a private pool and the restaurant serves great food. Super romantic. Tradition meets cool contemporary on the most spectacular island in Greece. A series of cave houses in the cliffside, with white on white decor broken with stylish aztec bed throws. Impossibly perfect infinity pool and an intimate poolside restaurant both boast killer views. Ideal for honeymooners. Honeymoons - Sun, sea in a wonderously romantic honeymoon suite with private terrace, secluded Jacuzzi and sleek modern interiors. Sailing - Sail around the island and take in the stunning white villages and deserted beaches. 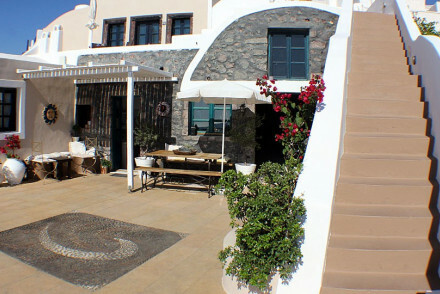 The Vasilicos is located in the viIlage of Imerovigli, high in the mountains of Santorini. Boasting spectacular sea views, the hotel offers seven simple chic suites which all feature a spacious terrace. Choose your own menu and enjoy a private candlelit dinner for two at sunset! A stunning spot. 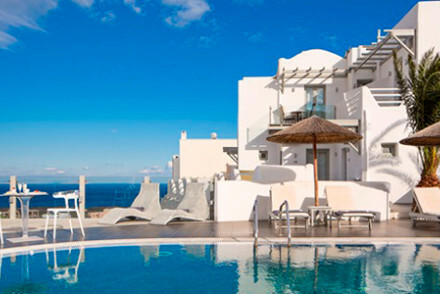 Five Star Santorini-chic designed for honeymooners and romantic getaways. Unusual rooms, suites and maisonettes carved from the cliff face. 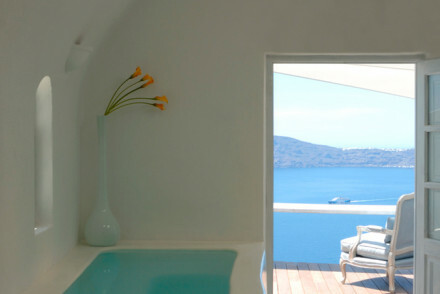 Dreamy Caldera views, private hot tubs, all white furnishings. A very romantic spot within walking distance of the town centre. 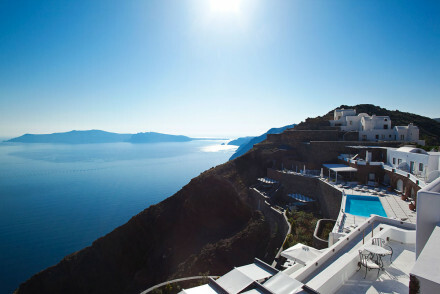 Five Star luxury and Santorini chic from the cliff top. Gorgeous all white suites with private jacuzzis, butler service and balconies. Gourmet restaurant, extensive spa, and all-round perfection. An ideal choice for romantics, honeymooners, and weddings. A gorgeous hotel with wonderful day areas and terraces dotted around. Spectacular views, lovely restaurant, and creamy rooms. Intimate, very romantic, and oh so chic. A great spot for couples and honeymooners. 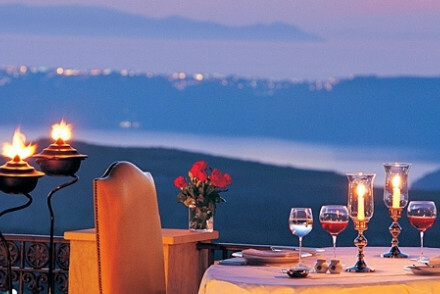 Fantastic, five-star hotel facing out over the Aegean Sea. 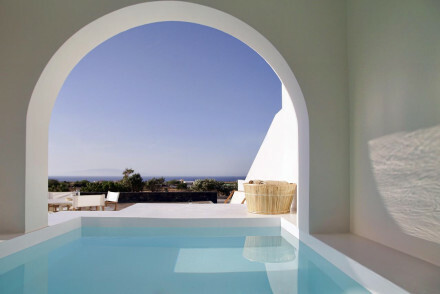 Fastidiously designed in line with Cycladic style, the suites are elegant and luxurious with crisp, whitewashed decor. The deluxe spa feature relaxing pods carved into the cliff and the restaurant serves delicious seafood. A clifftop wonder. Total relaxation - With a serene coastal setting, excellent on site cuisine and deluxe spa, it's ideal for a relaxing holiday. Romantic Break - Luxurious suites and a heavenly location combine to create the perfect place for a romantic getaway. 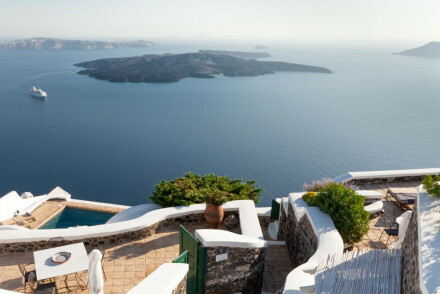 Sights nearby - Visit Santorini's volcano and Thirasia Island just three miles away. Diving - Take diving trips out from Oia harbour. A collection of lifestyle houses converted from 300 year old caves, built into the hillside. Spectacular views and complete tranquility meets laidback luxury and style. 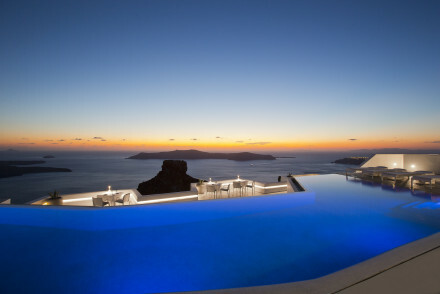 Stunning infinity pool, beautiful terraced gardens, and superb contemporary Greek cuisine. A wildly romantic destination. 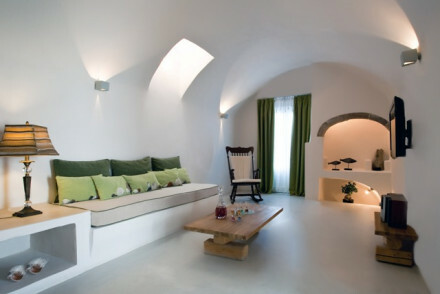 Hideaway - Set in 300 year old caves this stunning seaside property feels a-million miles away from everything. Sailing - Take a boat across the lava islands for magical views of the sulphur exuding caldera. Great walks - Explore the winding alleys of Oia, filled with charming churchs and craft boutiques. Sights nearby - Discover the ancient ruins of the Minoan Akrotiri. 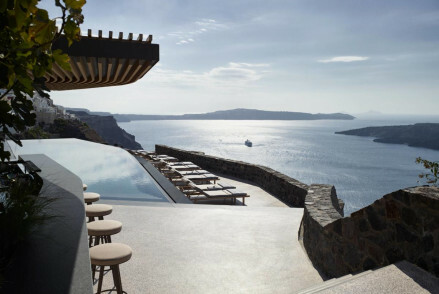 This seafront luxury hotel in Oia offers stunning vistas across the Aegean. The suites have classic interior design with stonewashed bathrooms and nautical colours; the best lead onto a private infinity pool overlooking the sea. Don't miss the clifftop restaurant and sleek spa. A breathtaking hotel. A hotel cut from the cliff's edge with wow factor views and indulgent surroundings. All white rooms, suites and a palatial villa with fabulous private balconies and hot tubs. Lovely Mediterranean restaurant and extensive spa. Truly romantic and luxurious. 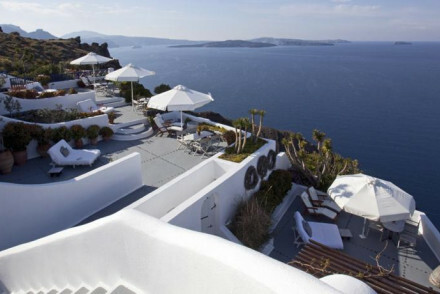 A totally unique boutique honeymooner hotel draped over the cliffs of Oia. Cool and tranquil luxurious rooms with stunning views. Exceptionally lovely infinity pool and spa. Fresh mediterranean cuisine is served poolside as well as fine dining on the rooftop. The ideal place to completely unwind. Total relaxation - Enjoy A.Spa's restorative treatments, cocktails by the infinty pool, phenomenal rooftop dining and impeccable 24 hour service. Honeymoons - Sun, sea, tranquility and oh-so-romantic- five star service in these achingly chic cliff side cottages overlooking Caldera. 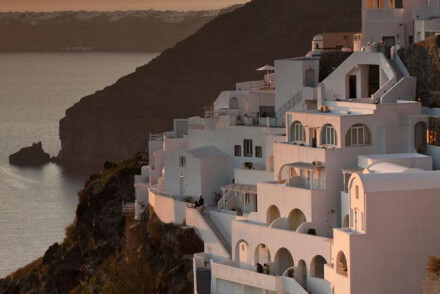 Sights nearby - Visit the nearby village of Oia, the main square and sunset views are breathtaking. 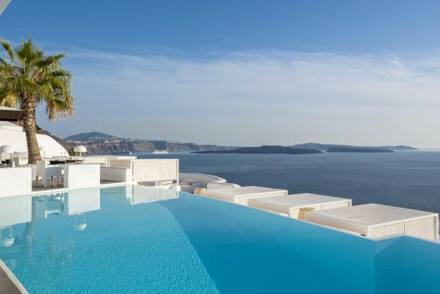 Swimming Pool - Gorgeous infinity pools - Top 50 Hotel pools.